This category contains 6 products. Looking for those elusive Lone Star State ancestors? 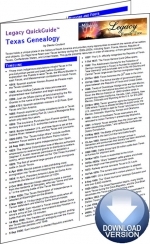 The�Texas Genealogy�Legacy QuickGuide™ contains useful information including a timeline of Texas history events, tips on Texas research strategy, outline of major immigrant groups, and more. Also included are links to websites and resources covering vital records, church records, census records, as well as general Texas resources. This Texas-sized 12-page PDF guide can be used on your computer or mobile device for anytime access. Births and deaths are critical events in our ancestors’ lives; however, we often find no official vital records exist. This presentation shows a variety of alternatives – some obvious, some obscure – you can use to identify birth and death events. 1 hour 9 minutes plus 5 pages of handouts. The recording is also included as part of the�monthly�or�annual�membership. 1 hour 13 minutes plus 5 pages of handouts. The recording is also included as part of the�monthly�or�annual�membership. While land records primarily prove ownership and transfer of real property, they may provide the evidence needed to prove family relationships. Researching Texas land records can identify husbands and wives, identify parents, siblings, and children, establish relatives and relationships, and locate neighbors and neighborhoods. 1 hour 3 minutes plus 7 pages of handouts. The recording is also included as part of the�monthly�or�annual�membership. 1 hour 10 minutes plus 5 pages of handouts. The recording is also included as part of the�monthly�or�annual�membership. 1 hour 39 minutes plus 8 pages of handouts. The recording is also included as part of the�monthly�or�annual�membership.